In the modern game, there are very few players that can be classed as true entertainers. Back in the 70s, the English game was awash with them. Frank Worthington, Stan Bowles, Rodney Marsh, Alan Birchenall, Duncan McKenzie and dare I say, George Best, spring to mind and you can add to that list a flamboyant midfielder by the name of Tony Currie. As a kid, Currie was disregarded by Queens Park Rangers at the age of 14. He joined Watford and from there he moved north to Sheffield United. It was at Bramall Lane where his special talent was truly recognised and he was recently voted the South Yorkshire clubs greatest ever player. Playing alongside his great friend, the late Alan Woodward, the pair helped the Blades to a sixth place top flight finish. In fact, they ended the 1974-75 season just four points behind the eventual Champions, Derby County. “I handed in three transfer requests but they were all turned down. We went away to Gibraltar for pre-season training and whilst we were over there the manager, Jimmy Sirrell, told me that when we returned to England I had to go and see John Harris who was one of my previous managers at the club. “Sure enough I did as I was told and we got into John’s car. I had no idea what was happening or where we were going and due to my shy nature I didn’t ask any questions. “The next thing I know, we were in Leeds driving through the gates of Elland Road. John told to me to go in and see Jimmy Armfield and although I remember very little about the conversation, I signed the paperwork and became a Leeds United player. “I knew a lot of the lads from time away with England and although Don Revie’s ageing side was slowly being dismantled, they were still world class players and brilliant lads. “I enjoyed my debut and I had a decent game, developing an instant rapport with the supporters. I had managed to score on my debuts for Watford and Sheffield United but unfortunately I didn’t achieve that at Leeds, despite trying my luck from every angle against West Brom. “We enjoyed a brilliant cup run but unfortunately fell at the Semi Final stage and that was a major disappointment. The trend would continue and in each of my three seasons at Leeds, we lost in the Semi Finals of major cup competitions." When the 1978-79 season got underway, few would have imagined that it would be Tony Currie’s last as a Leeds player. The campaign kicked off in glorious sunshine at Arsenal and the hugely popular midfielder provided a magical moment when he hammered home an unstoppable volley from a seemingly impossible angle which silenced the North Bank. A stunning strike which helped Leeds to a 2-2 draw but it was quite simply a taste of things to come. “It was an amazing moment; it was as if a gust of wind had blown across Elland Road and affected the direction of the ball. I could see how happy the crowd were and how much they enjoyed the goal. There were no wild celebrations from me. I stood my ground and clapped the supporters on the Kop for clapping me and for a few seconds I felt like the King of the World. “You see goals like that every week in modern day football but back then they were a rarity and the effort won the ITV Big Match Goal of the Season competition." “As we had done in the league, we battered them at Elland Road but inexplicably let a two goal advantage slip and we were devastated not to take a lead down to The Dell. “My wife, at the time, had never settled in the North and she had returned to London. My head was all over the place and I travelled to Southampton for the second leg on my own. “Looking back I should never have played. I had a real stinker and never got involved in the game leaving me to realise that I had let the club, my team mates and the supporters down as a 1-0 defeat denied us a place in a Wembley final. “I realised that for the sake of my family I would have to leave Leeds United and return south. It wasn’t an easy decision and it broke my heart. However, looking back, I believe that arrangements could have been put into place that would have ensured I remained a Leeds United player. I could’ve trained in the Capital and travelled to Leeds for the games." “We had some world class players and due to the fact that many were coming to the end of their careers, I would have to say Arthur Graham. He was a fantastic winger, fast, tricky, he could score goals and was comfortable with the ball at either foot. Off the pitch I spent a lot of time with Arthur and we enjoyed some great nights in the Bingley Arms with Ray Hankin. “Ray himself was a top player, he suffered terribly with knee problems but he would run through a brick wall for you. “Brian Flynn was a superb footballer despite the fact he stood four foot nothing and we remain good friends to this day, playing a lot of golf together. "We had a wealth of talent between the sticks, the two Dave's, Harvey and Stewart were tremendous 'keepers and they never let anybody down. 'Lash' (Peter Lorimer) was a superb player but it was only until I played alongside him that I realised he could do much more than rocket a shot into the net from 30 yards. “Another player who I thought a lot about was the late Byron Stevenson. He was much underrated and should have played far more games than what he did. He was comfortable in every position he played in and he reminded me of a young Paul Madeley. "What a finisher Allan Clarke was. I would put him up front with Jimmy Greaves in my all time England XI. I would play the ball through for 'Sniffer' and turn round and walk back to the centre circle as I knew he would do the business." Players like Tony Currie are few and far between and when he left Elland Road to return to London to play for Queens Park Rangers, a huge hole was left in the Leeds United midfield and supporters were well and truly devastated – so were the players. Paul Hart told me in his interview for ‘He wore the white shirt’: “Tony Currie moved on and I was distraught when he left. It makes me laugh when I read people’s perceptions that Tony was lazy. He worked harder than anybody at the club. He was strong, fit and had all the talent in the world." "That's nice to hear that 'Harty' said such things but it doesn't surprise me. He was a fantastic player in his own right but the truth is, he idolised me and would have married me if I had let him!" “We were over in Germany preparing for the season to start and the lads ended up in a night club rather worse for wear. Billy Bremner and I had become detached from the group and decided we would leave to get some food. “It was 4 o'clock in the morning and we had no idea where we were so we randomly boarded a tram and luckily found a bakery. I came out of the bakers to discover that Billy had disappeared and I eventually found him in a van, slumped over the steering wheel fast asleep. 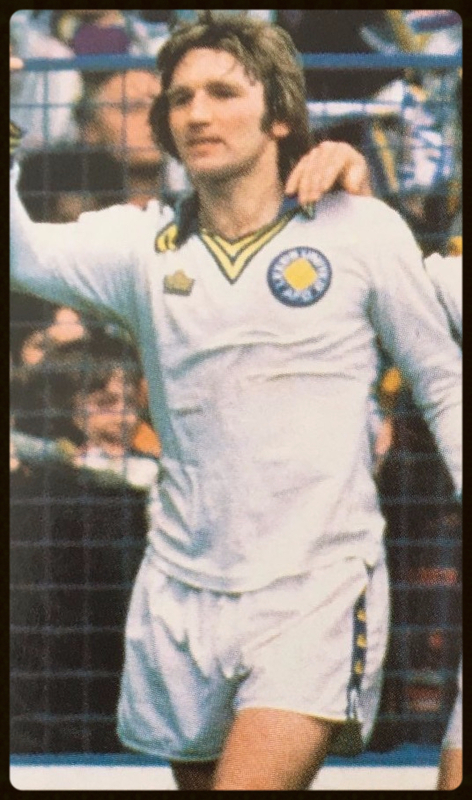 Just recently Tony enjoyed a Q&A night with the Bradford branch of the Leeds United Supporters Club and if you’re holding a function and looking for a former legend to attend, please contact me and I will pass on your details to Tony who will gladly attend, if he can. “Leaving Elland Road, the players and the fans was the biggest regret of my career. For me, between 1964 and 1974, Leeds United had been the best side in Europe and although my time there came after the halcyon days, it was a real pleasure to play for such a great club and although, at times, I felt the weight of expectation, I loved every minute of it." Thank you to Tony Currie for his time and giving me the opportunity to write this article.